First Lines: I bumped into my old girlfriend Katie Landry this afternoon. Six hours later, she was dead. John Ceepak and Danny Boyle are in Atlantic City when Danny runs into a former girlfriend. Katie's working for a magician, and her life seems to be going great. Danny is happy for her, but his happiness turns to sorrow when Katie is found strangled to death. Ceepak and Boyle will be staying in Atlantic City longer than they'd planned. They have Katie's murder to solve-- and lives to save. 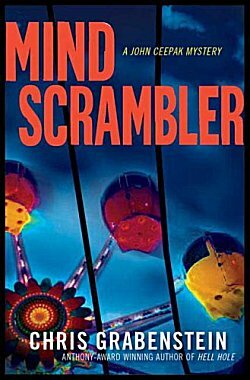 I always enjoy Chris Grabenstein's Ceepak and Boyle mysteries, and Mind Scrambler was no exception. Strong characters, a strong setting, and a strong mystery laced with Grabenstein's trademark humor. What's not to like? Although there is humor in the book, it's not as pronounced because the subject matter is serious and our Danny is grieving. Grabenstein knows how to write action scenes as well as strong characters and humor-- and he also knows how to tug on our heartstrings. There is one thing, however, that I wondered about all through Mind Scrambler. There are times that the tower of integrity that's known as John Ceepak is almost a cartoon figure with his exaggerated "Just the facts, ma'am" language and his unyielding book of rules. Once-- just once-- I'd like to see a scene of dialogue between Ceepak and his wife Rita when they're alone. Does Ceepak still sound like a stuffed shirt then, or does he actually unwind a little? It will probably never happen, but as I enjoy reading each book in this series, I can always dream. I've always felt the same way about Ceepak, Cathy! Still, he is a great character, and I do like the Ceepak/Boyle dynamic. The stories themselves are solid, too. Glad you enjoyed this one. And this entire series has been about Danny growing up, I think. It's fantastic that he found such a wonderful role model.